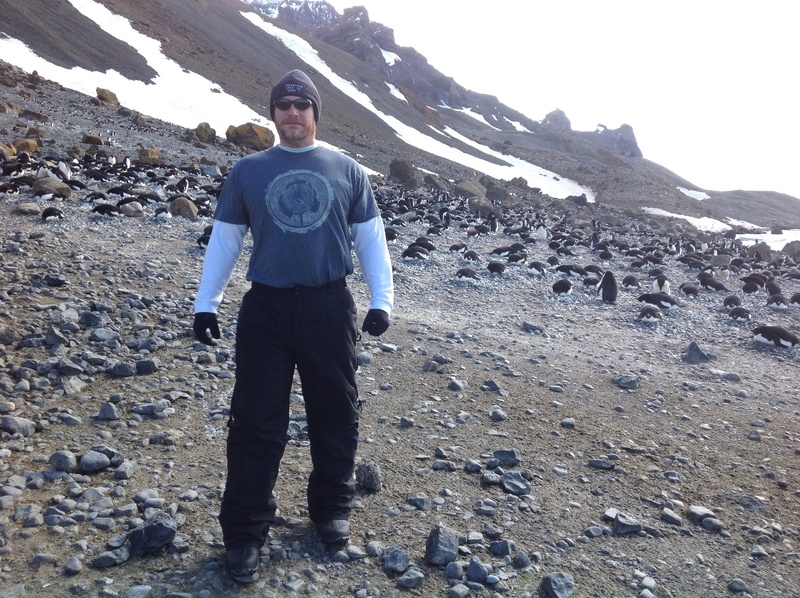 Adam Vines: From Alabama to Antarctica, from poems to penguins. When I think about “nature poets,” I often unfairly stereotype the idea into two camps: the contemporary Cassandras and their warmings and warnings or the Hallmark Thoreaus, full of simple awe and wonder. That’s unfortunate; it’s just as hard to write new, meaningful nature poetry, as it is to write new, meaningful love poetry. The talented nature writer guides readers into looking at the world in a new way and in a culture that feels more and more separated from the world of earth and leaf, the nature writer may be more important than ever. For example, I know what “hashtags” are and what “hermeneutics” means, but I have no idea what kind of grass makes up my lawn. That’s embarrassing. Adam Vines is the talented kind of nature poet. And while it would be too limiting to call him simply a “nature poet,” his first collection, The Coal Life, contains many fine examples of the genre. The book is full of loam, marshes, digging, and decay. And, besides a craftsmanlike command of sculpting sound and line, his work in the genre sends me to my own yard to learn the scientific and secret names of the natural world around me. What more could one ask from a book of poems? Eunoia Solstice is grateful to Vines for giving us time out of a busy schedule of writing, teaching, and readings to answer a few questions. First, I’d like to hear about your trip to Antarctica. What was that like? Has it inspired new writing or is it something that will be sitting with you before you write about it? My trip to Antarctica was humbling. For two years, I served as Jim McClintock’s editor and writing coach for his book Lost Antarctica: Adventures in a Disappearing Land (Macmillan, 2012), which focuses on climate change and its impact on Antarctica. Jim is one of the foremost polar biologists in the world and a colleague of mine at UAB. However, none of the research I did and knowledge I acquired while working on the book could have adequately prepared me for the otherworldly landscape. Humans are the only terrestrial mammals, and we are such an invasive species there and so helpless in and ill-equipped for that environment. I didn’t see the color green in the natural world for nearly two weeks. Instead, I witnessed brilliant hues of blue and white from icebergs and glaciers and the darker blues watching me from blue-eyed shags, with the occasional safety-cone orange streaking the beaks of Gentoo penguins, rusty clouds of krill expelling from a surfacing humpback whale, and deep red research shacks that seemed so absurd in this bewildering, unaltered landscape. I watched skuas—predatory birds—pickpocket eggs from Adélie penguins by yanking their tail feathers on one side and skewering the eggs with their beaks on the other side when the penguins looked behind them. In a Zodiak—a rigid, inflatable raft with a 70 HP engine—I followed humpback whales tailing and bubble-feeding for over an hour. I climbed mountains; I stared into the eyes of a leopard seal; I went swimming in the Antarctic Ocean. The experience was life-changing. I wrote in my journal and sketched what I saw while on the trip. I have a few drafts of poems, but I haven’t figured out the right approach for the poems yet. I do not want to merely write a penguin poem and a seal poem and an iceberg poem and a whale poem. The subtexts and underlayment for the poems are not revealing themselves yet. I still need to field-dress my experiences in my mind a bit. Since teaching and writing are at least second careers for you, what led you to writing, particularly writing poetry? I started a landscaping company after I graduated from high school and took classes at UAB part time, though I have always been a student of the natural world. I grew up camping, hiking, fishing, hunting, and paddling. Though I had never written poetry before, I decided to take a poetry writing workshop when I was in my mid-20s. Then I took another the next semester. Bob Collins and Jim Mersmann, professors and poets at UAB, encouraged me to continue writing and became my mentors. Writing was just an outgrowth of my intrigue with the natural world and the culture of the South. I would construct lines of poetry and form images while I cut grass or dug holes for plants or trimmed trees. Poetry occupied my mind while my body worked. An Old English professor and Beowulf translator told me once that he was hammering out half-lines, which made complete sense to me. The word poet comes from the Greek word for “maker.” This is labor—hard damn work, blue-collar work. I am much more comfortable with a fishing rod, shovel, pick, or brick hammer in my hand than a pen, so this idea of writing as blue-collar labor suits me. Are there particular writers who have been important or inspirational for you? Poetry: Bishop, Marianne Moore, Amy Clampitt, Whitman, Gary Snyder, Yeats, Lowell, Kunitz, Jeffers, Heaney, James Wright, Merwin, Stafford, David Bottoms, Andrew Hudgins, Rodney Jones, Betty Adcock, Claudia Emerson, Alicia Stallings, Caki Wilkinson, Carrie Jerrell, Linda Gregerson, Pimone Triplett, Greg Williamson, Michael Hofmann, Hecht, Wilbur, Justice, Hollander, Snodgrass, Larkin, Louise Bogan, Schnackenberg, George Herbert, Edward Taylor, Donne, Milton, Shakespeare. Prose fiction: Padgett Powell, William Gay, Barry Hannah, Flannery O’Connor, Kevin Wilson, Carver, Cheever, Mary Wilkins Freeman, Hemingway, Chopin, Orwell, Kafka, Bulgakov, to name a few. Drama: Shakespeare, Jonson, Ibsen, Beaumont, August Wilson. As a husband, father, professor, editor, and avid fisherman, when are you finding time to write? Do you follow a daily schedule or ritual? I do not have a ritual. I still tinker with images and construct lines in my head as I did when I was a landscaper, so, in some ways, I am constantly prewriting and revising. I usually have a solid chunk in my head when I sit down and pick up the pen. I write when I am compelled to write, which means that I have to make time for writing when it comes on and move everything else, except my family, aside. I have never been one to try to force the action with a writing schedule. What are you currently working on? Any new publications? A new book forthcoming? I have a collaborative manuscript I wrote with Allen Jih, a friend from graduate school who is an aerialist and yoga instructor in Las Vegas, that I am shopping around to presses. We send lines back and forth over the Internet until one of us decides the poem is finished or becomes bored with it and writes “Cooked.” Then we start another. We started writing collaboratively to challenge ourselves to truly write to the unknown, to surprise ourselves, to challenge our preconceived aesthetic notions. We are currently working on our second manuscript. We have the same rules, but we also added that every poem will be constructed with trimeter tercets. I am also at work on a new manuscript of ekphrastic poems. I buried myself in New York museums for eight days over the Christmas break of 2012 (Guggenheim, MOMA, Frick, Whitney, and The Met), and I have visits to The National Gallery and the Art Institute of Chicago planned for late spring of this year. I am interested in how audiences interact with art at museums, from the docent who does not know how to talk to children about art and ruins their experience with it, to the dilettante on a date who “explains” the paintings so everyone in the room can hear, to the person who stands for hours in front of a Picasso he or she knows well but is obviously seeing live for the first time. I am allowing the poems to stretch the canvas to encompass whatever context surrounds it. I have a draft of a poem where a real staircase extends into the staircase in a painting. I allow my interactions with people in the museums to commingle with the drama encapsulated within the paintings. I have published some of these ekphrastic poems in 32 Poems, Gulf Coast, The Southwest Review, among others. Maybe one of the easiest ways of getting into The Coal Life is through the recurring topics such as childhood, the relationship between father and son, the relationship between humans and the earth, but before that, I was wondering about the language of the book itself. It feels like the book is dominated by an Old and Middle English vocabulary. Do you think that’s true or am I making too much of the mood or atmosphere created by the nature terminology throughout the book (“slough,” “whelks,” “coal,” etc.)? I am attracted to language/jargon from industry and disciplines outside of what we commonly associate with the arts. My first poetry mentor told me that attentive poets know the names of things and the names of the working components of things and their pragmatic relationships, which always leads to figurative notions. Furthermore, I love the syntactical and phonetic gaits that poets can create by comingling or isolating and loosely segregating Latinate and Germanic language, which can also have lovely effects on the rhetorical and narrative viscosity. One of the topics of the book seems to be cycles, or if not cycles, at least the past in all its myriad meanings, including our mythic past. I read that in the “coal” of the title, “Prologue and Return” and “Epilogue and Return,” the men going and coming from the mines and quarries, and the mother in church. Many of the speakers seem to be “haunted” by a past that has been shut away, but keeps returning. The past comes back, exhumes itself, like the toy soldiers in “Burying the Dead.” This imagery in the book, makes me think “ashes to ashes, mud to mud.” And then you also play a few times on your own name and its connection to that mythic “Adam” and the clay he is often said to have been made of. Am I way off here, this weaving of loam, cycles, and memory? Had you been working through these ideas for a while or were they something that came together as you were organizing the manuscript? Whitman’s, Hegel’s, and Vico’s ideas on cyclicity and the great respect and attention I pay to the natural world’s cycles and recapitulations inform my poetic sensibility as much as anything, but I never overtly thought of trying to infuse these ideas into the poems or I would have ruined them. The coal mining industry and the disrupted and destroyed then reclaimed landscapes, the miners digging at the maw of the earth to extract the compressed, encapsulated energy of the past; the human anxieties that persisted in a cultural landscape where methane blasts and cave-ins and horrific injuries and disease and labor wars were so prevalent and the result of untenable working conditions and corporate apathy and greed are literal ideas with complexly layered subtexts. Many of my relatives were coal miners. My family has owned land on the Warrior River in Walker County, Alabama—coal-mining country—since the mid-1800s. The first log cabin still remains on the property, as do the remnants of a rock cabin my grandfather built in the 1930s, which was sadly torched by hunters I had to walk off of my land by gunpoint when we had a dispute. They said they would get me, and they did. The remains of old shine stills still hunker into the banks on the property; the ribs and spine of my kin’s old ferryboat slowly rots into soil beneath a large white oak. I grew up observing the landscape altered by coal mining: the undulating spoil piles with pulp pines jutting from them and the deep blue quarries. I would watch the coal barges’ spotlights fidget down the riverbanks at night, searching for the start of the great oxbow where our property sits, while my father and grandfather told me stories about the land and our kin and flirted with barred owls, calling them to within a couple dozen feet of us. So, yes, the soil, memory, and cycles organically fused in the poems, I hope, this fusing having its foundations in the endemic richness of the subject matter more than my intentions. I didn’t notice the theme of Calvinist suffering, that “ashes to ashes, mud to mud”—a kind of backwoods Job—that return and return and return, that end without end, echoing the Nicene Creed, you mention until I started looking at the thematic ribbons in the poems when I ordered the manuscript. The theological and typological underbellies fit, I hope, considering the personae in the poems and the subject matter. Several of these poems are about the complexities of the relationship between father and son, which parallels the relationship between “The Father” in the form of religion and the working community. “Burying the Dead” is one of my favorite poems in the book (as is “Brick Hammer and Broken Watch”) and is deceptively simple. I initially read it as a narrative about the boy mimicking his father that ends with the image of the toy soldiers and how “the arms of the buried rise again.” But the opening line (”It always happens like this:”) directs me to read this more in terms of memory or dreams, as if the speaker is recalling aspects of his life that he has tried to bury, but they keep coming back. The “storm” cuts the communication from the father and son and could be the natural complexity of the relationship or the natural separation at this point—the father’s death. Is there something to seeing these images or topics playing off of each other? If these poems mirror your own experience with your father, what was it like writing these poems? Do you care to speak toward your views on religion and social class? Thanks for your kind words about those poems. The theme of the dislocated father is such an archetypal one; Christianity has its foundations in this tension. I lost my father when I was eighteen. “Burying the Dead” and “Brick Hammer and Broken Watch” are two of the most autobiographical poems in the collection. They both deal with memory and how one comes to terms with the death of the father, or if one every really can move beyond the sorrow, and how one prepares for fatherhood when the model is no longer around. “Burying the Dead” is based on a recurring dream I had for years. What I don’t include is the end of the dream, where I chase my father around the church, and he keeps getting farther and farther away. Then I come around a corner, and he has a new life. He is pushing another child in a swing and doesn’t know me. The dream haunted me. This separation of father and son comes up often in the persona poems set in the coal mining community. My theoretical slant when I criticize Early modern English texts is grounded in social class theory, specifically how people within a particular social class distinguish themselves, how and why stratification occurs within a fixed class of supposed equals who are relegated because of blood and name. My father was a bricklayer by trade, who later became an unsuccessful insurance salesman when building declined in the ’70s. I was a blue-collar worker for over twenty years. I do not directly address class issues and class systems in poems, but my interest seeps in. How can one not evoke class struggles when referencing the coal mining industry? The poems in The Coal Life question faith. The speakers want to believe in something so badly, but the empirical, practical world provides walls. My personal questioning and the brief moments of clarity I have had in my life inform the personae’s struggles and catharses. Are there particular poets you have studied in terms of form or sound? What writers have been important in your development of formal skill? I feel like the poem “Tracks” displays some of these devices and is a great poem to listen to. As far as form, in one sense, it’s obvious that the stanzas are lengthening, but in another sense, I can’t figure out if you used a particular syllabic or metrical count. Does the line just grow organically (which makes sense considering the subject of the poem) or did you develop a form for the poem? If you want, feel free to keep it a mystery—“magicians’ rules” and all that. I learned most of what I know about prosody and poetics from studying early modern English poets and playwrights, which was my critical concentration in my first graduate degree before I turned almost exclusively to creative writing. I chose the U of Florida for my MFA in poetry because I wanted to study with William Logan, a talented critic/formalist, and I learned quite a bit from him. I continue to apprentice myself to the poems of Justice, Wilbur, Clampitt, Hollander, Merrill, Hecht, Hudgins, Bishop, Prunty, Larkin, among others, and a host of younger formalist poets, most of whom studied at Johns Hopkins, Arkansas, Ohio State, or Florida, which are programs with formalist leanings. Though “Tracks” is held in quatrains, its rhyme scheme changes from stanza to stanza. I wanted to defy expectations of sound connections and placements, which I hoped would add to the ambiguous relationship of the two people taking a mysterious journey together. The lines evolve from stanza to stanza, I hope, from lyrical, image-driven shorter lines with loose syllabics, to longer more rhetorically-driven lines that have a loose iambic backbone. I hope that the protean form matches the nature of the unfolding human drama in the poem. Several artists, including Magritte, Wyeth, and Gauguin, make appearances in the book as themselves or in their work. I even wonder if “Darwin Dreams of the Second Coming” is a sly form of an Arcimboldo portrait. Is art, and by this I mean drawing and painting, a continuing inspiration for your work? When did this start for you? What’s different, if anything, about composing work based on art from work based on other experiences? I love the idea of my Darwin poem resembling an Arcimboldo portrait! I was not thinking consciously about his work, but I adore his portraits. Yes, visual art plays a huge role in the way I approach writing. My language is image-driven more than voice-driven. I study imagery in the way a visual artist looks at a still life. Visual art has been and continues to be a huge influence on my work. At one time, I painted and sketched. I guess I still do, just now with language and lineation instead of paint and graphite. As I mentioned in an earlier response, my next collection will contain many ekphrastic poems. The Coal Life has quite a few poems that at the least mention visual artists or paintings; some are devoted to them. When writing about art, the moment in time and imagery are encased. The visual rhetoric is what I am interested in most: anxieties between objects, people, the natural world, colors, textures, etc. The painting may have a narrative embedded in it or fruitfully ambiguous tension or idea. My poems are essentially responses to the rhetoric. Read Vines’s poem “Mayflies” here.